This package contains skins and decals to recreate USAF ANG F-100D squadrons as seen/used in the 1971-79 timeframe. This is the basic reason for choosing the "68" model Hun; even though many of the units used Cs, Ds and Fs all at the same time. I choose the late-model as it's just a tad more sophisticated (RWR). 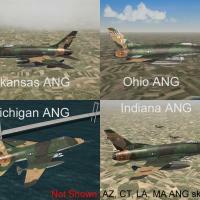 With very slight editing (ie: skin bmp renaming), these should work on all model Huns (including the C -but this has NOT been tested), excepting perhaps the F-100A and it's variant. The tail badge decals were originally created by Dave (USAFMTL) for SF/Wo*, and have been slightly modified by me for use here in SF2. When/where necessary, seperate Tail Code lettering was added. Serial numbers & insignia are all stock-ingame items, except as noted. Randomization is set the "TRUE" for the serial numbers.